The division of Facial Plastic & Reconstructive Surgery was founded in 1995 to keep up with the rapid advances in this emerging subspecialty. As staff members in this division we are dedicated to provide our patients with the best possible care by striving to keep at the leading edge of our specialty .This is only possible through our strong belief that learning is a continuous process that does not stop with the attainment of any kind of certification, and that the only way to perfection is continued education and intensive training. To provide the highest quality facial plastic service to our patients. To achieve the proper understanding and recognition of the specialty of facial plastic surgery by the medical profession and the public at large. Reanimation of the Paralyzed Face. 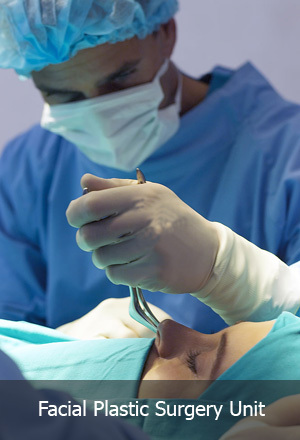 Surgery for Congenital Facial Anomalies. Microvascular Flaps for H&N Reconstruction. Local Flaps for H&N Reconstruction. Head & Neck Scar Revisions.